Wedding photographs are meant to be treasured for years but for some couples, striking that comfortable, happy pose on the big day is not always as easy as it sounds. While some lucky brides and grooms might have been blessed with the natural ability to strike a convincing photo pose at any given moment, the majority of us don’t have that inherent skill. That’s why the vast majority of couples hire professional wedding photographers who not only know how to capture the moment but also offer advice on how to really make a picture say a thousand words. Of course, couples getting married in one of Thailand’s private villas already have a a fabulous tropical backdrop for their wedding shots, but it’s still important to avoid striking poses that look too forced or cheesy. Below are some tips form the professionals. A pose in where the bride stands with her back to the groom with his arms around her waist is something of a classic. Not only can the couple demonstrate their closeness, but the action is also symbolic of their future togetherness. Newlyweds embracing and gazing out into the horizon are looking forward to spending their lives together, and all the new adventures and challenges they will face as man and wife. If you’re saying your vows in Thailand, this is a great pose to make the most of the spectacular scenery, as you will most likely be staring into miles of endless blue ocean. According to professional wedding photographers, it’s not a good idea to have too many photographs where the bride and groom are staring into the camera, smiling and joined at the hip. Instead, you can add some drama to your wedding album by introducing movement and having the groom (literally) sweep the bride off her feet. It’s best of the bride and groom are looking at each other rather than at the camera to give the photo more personal, intimate feel. It might also be a good idea to practice beforehand to ensure you can both sustain the pose without any injuries. If you hate smiling at the camera, then alternative angles will definitely appeal. Some of the best, most natural-looking poses are often captured from behind the bride and groom. Not only does this show off the detail of a backless gown or a sharply tailored suit, but it also gives the impression the couple are enjoying a precious moment alone on their wedding day – very romantic for the end of the album. 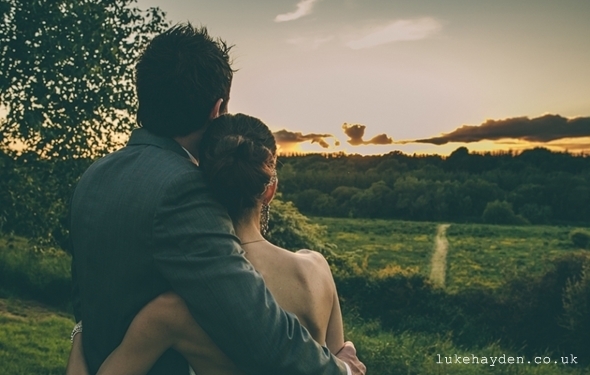 It’s your wedding day and you may find yourself hopping from foot to foot with nerves and excitement. If you simply can’t stay still, then ‘The Walk’ is an ideal pose to keep you busy. This pose is ideal for brides and grooms who feel stiff and unnatural standing and smiling at the camera. It can also introduce a little movement into the photo selections. If you have trouble making your smile look natural, going on a little walk with your partner down the beach will also give you time to talk privately and have a giggle about any of the hiccups that may have already occurred during the wedding day. Just make sure the photographer is on hand to capture all the genuine smiles and laughs along the way. For some couples, the quintessential kissing pose may be a shade too cheesy to even attempt. However, the Hollywood kiss pose takes the clichés away and makes the photograph into something a little more fun, not to mention classic. It might take a few practice kisses to get this one right, and brides should be careful not to strain their backs. Even if the photographer captures a few failed attempts, that adds to the fun and makes the final selection just that little bit more romantic and special.